UESP Forums • View topic - Which Daedric lord will we spend quality time with next? Which Daedric lord will we spend quality time with next? Post subject: Which Daedric lord will we spend quality time with next? I get the impression that the Daedric lords are some of the series' most beloved characters, and it seems like tradition for each game to have one expansion that heavily emphasizes one of them. With that in mind, who's next? I'm assuming the ones we've already had in said expansions are out, as are the ones who've turned up as main questline antagonists. Post subject: Re: Which Daedric lord will we spend quality time with next? Ignore this as i somehow managed to get this thread mixed up with another one. Last edited by The SheoDovah on Sun Sep 22, 2013 9:12 pm, edited 1 time in total. Oblivion's vanilla was heavily focused of Mehrunes Dagon. Later on the two major expansions each had their own focus, SI had Sheogorath and Jyggalag while KotN had Meridia. Morrowind had Azura play a part in the events, but it was namely the Tribunal in focus. BM expansion however had Hircine. These are just merely the recent 3, but some of the older do indeed hold ties. I'm not going to speculate based on past occurrences, because we don't have very much to work with. As for who I would like to see in focus? Meridia, without a doubt. She's quite mysterious—from her sphere of influence to her potential origin. The Break of Dawn was neat at least in that it implied that she is seeking followers. It also indicates that she once had a not-insignificant following in Skyrim. In general, though, it seems that she's fairly neglected as far as the Daedric princes go. Perhaps this is because of her relatively "good" nature or because she presumably rarely has need to interfere with mortal affairs in the same way that many of the others do. I want to be scared or disgusted, so I'll go with Vaermina or Namira. Though I'd also like to escape a series of Sanguine's Realms as a Lotus Eater Machine kind of thing. I can see Vaermina being used as it gives Bethesda an excuse to go crazy with new locations. If it's going to be anyone it should Vaermina, Peryite or Meridia. These three have been barely developed, and we know next to nothing about them, giving a lot of freedom for their stories. 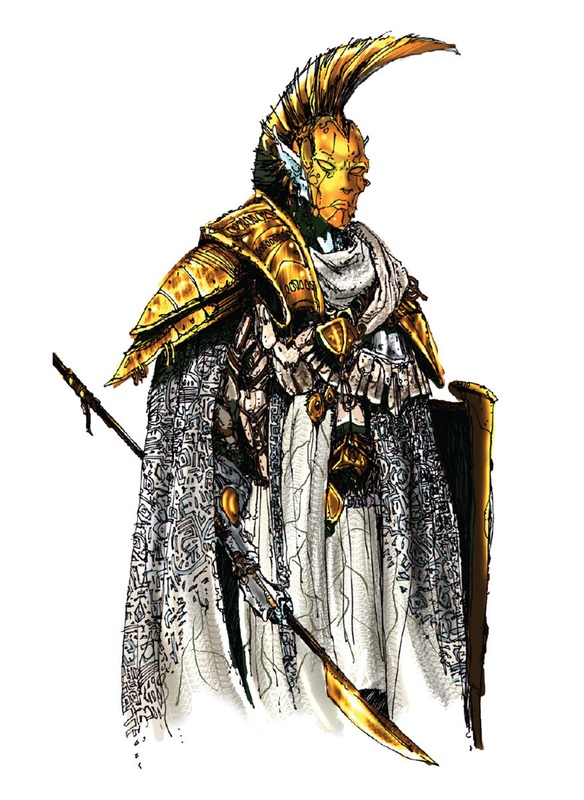 I'd really love to see something with Peryite, maybe inciting a civil war among the Deadra, sick of being labelled the weakest prince, or attempting to spread his diseases across all of Tamriel. The expansions that have featured Daedra in the previous three TES games have all been focused on Daedra that provide a fairly demarcated contrast to the vanilla game and the world it presents. You'd think that for Morrowind, one of the three Anticipations, or possibly one of the Four Corners would be appropriate, but Bethesda went with Hircine as part of what was clearly a concerted attempt to create content that provided a meaningful contrast to Vvardenfell on the isle of Solstheim. The same can be said for Sheogorath in oblivion and Hermaeus Mora in Skyrim, so I feel if there is anything we can say this far out from TES VI it's that any DLC content that deals with one of the Daedric Princes will probably deal with one that stands in contrast to the world of the vanilla game. Not so much a full questline, but I'd like to see Jyggalag start getting his own daedric quests, after the events of Oblivion. ^ That would be neat; I'd be curious to see how they create interesting quests for, essentially, the god of dullness. I've talked about this once>_> a shame it be lost in some post..
One of my ideas was for Jygg to have his own shrine, very much secluded and hard to find alone. Though old Mora's was hard in Oblivion? Even harder=__= but the idea was for you to do a series of quests for him, each one receiving a reward for spreading his order and signaling his return, be it revenge on the other daedra or fixing some uneven paintings however as you slowly gain more of his favor, you can slowly start to compare yourself to one of his priests of order. You begin to gain powers like summoning Knights to even other little unique goodies. All the way till you receive his never before seen artifact<_< and an artifact alone that may be the mightiest I do say. Well, since he's been essentially absent for thousands of years, I doubt he'd have his own shrine yet, so perhaps creating one for him? Or restoring one and recruiting followers? Based on the business with Dyus it seems like Jyggalag's idea of order includes the ability to anticipate absolutely everything. Perhaps a quest where you have to ensure that events, even seemingly insignificant ones, occur exactly as he anticipates through subtle manipulations of the world. Kind of like The Adjustment Bureau, if you've ever seen that. Well all events already have been predicted, all possible futures, pasts, and presents. How? The Elder Scrolls. Not even the Daedra or the Aedra would dare challenge that power. Granted they too could unknowingly be the very ones that allow such events to occur. But as it is, every event calls for a hero whether he fails or not. Without a chosen hero, there is no event to follow. It'll be funny if the devs decided for the lulz that TES VI's major expansion won't have a daedra as its focus. Anyhow, I find Vaermina, Azura, and Sanguine have the most interest realms that could be visited. Vaermina because her realm sounds like a mind screw sort of thing, Sanguine because it sounds like it has character (like Shivering Isles), and Azura because it sounds... well, nice. Actually I kind of want Aetherius to be explored some<_< Malacath for one once was not of Oblivion but like those of the Divine. I really do wonder what has become of his old realm>_> or if it simply was 'moved' to where it is now. The Daedra are their realms. If Malacath is in Oblivion, so is the realm. I agree with Beta, Skullcutter, and Crusader about Jyggalag, however, since he is the Daedric Prince of justice, it would be interesting if he forced you to build his shrine for him, much like gathering materials for Hearthfire. After you build his shrine, you can do missions for him. Well in my view, he could just as easily create a crystal like shrine for himself, though lack the influence till his will has been known. In truth, it should be in a very isolated region, much like Mora's in oblivion. Someplace that just appeals to his crystal nature, much like snow and frost. It would be funny to see what once was a Sheogorath shrine corrupted and converted to Jygg's domain and appearance. Kind of gives it a little bit more irony into the detail. Jygg's sphere includes justice? Where does it say that? It may simply be a misunderstanding. Jygg represents absolute order, almost to the point where stasis would be paradise to him.. but torment for every other being in existence.. Think of him as the polar opposite of Lorkhan, chaos born from order, and order born from chaos.. I'd like it to be Meridia, we don't know much about her really and it'll be interesting to learn some more. How's about Peryite? there's a Daedric Prince that isn't mentioned enough. I think he needs some time in the sun, like was suggested earlier, perhaps a DLC that involves helping him to grow stronger in the eyes of the other princes? I always love an underdog story, and that's really how he comes across to me.